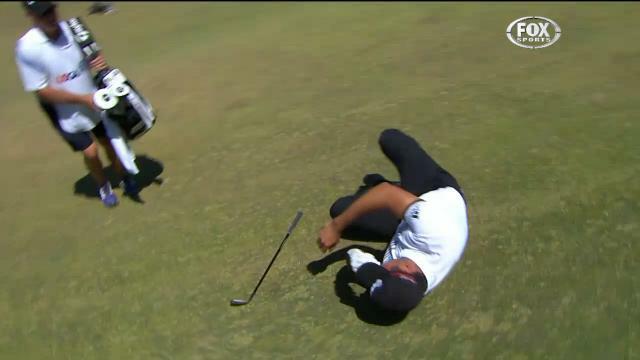 Golfer Jason Day collapsed with vertigo during round two of this year’s US Open at Chambers Bay on June 12. Jason Day, 27, who suffers with the condition for several years, needed treatment for a few minutes after his fall. The Australian regained his footing and missed a putt for par on the ninth hole – his 18th – before succeeding from four feet for a bogey to leave him on two under. Medical staff had to help Jason Day walk over to sign his scorecard but he said he plans to play on in the tournament. Jason Day’s agent Bud Martin said: “Jason was diagnosed to have suffered from Benign Positional Vertigo. He is resting comfortably. Playing partner Justin Rose, who shot a level-par 70 to stand at two over, said: “At first I thought he might’ve just rolled his ankle but then when I saw his caddie with a towel round him, I realised it was something else. Vertigo caused world No 10 Jason Day to withdraw from the World Golf Championship in Ohio in 2014 and last month’s Byron Nelson Championship.